For most of us, formal sit-down dinners are rare these days… making Thanksgiving dinner even more special. There’s something about coming together around our table that warms both heart and home and brings us closer to each other. What would add more warmth to this special family time than being surrounded by the perfect dining room furniture? Especially furniture that would serve as a beautiful backdrop for the holidays, but be casual enough to accommodate our lifestyle the rest of the year. With gently antiqued edges and a lightly distressed wood top that blends four different wood species into the plank-top veneer, the Legends dining room table does just that. 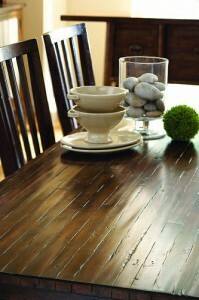 This leaf-free table is rich in character (you may be tempted to skip the tablecloth!) and at a generous 84” in length, it easily fits 8 people without having to take out a leaf before and after dinner. Slat-back chairs add more warm wood texture, but without the fancier carvings that would make this dining room feel too formal to use the rest of the year. Open shelves above the storage buffet add even more casual warmth, inviting us to surround ourselves with favorite things (favorite plates, hanging stemware, wine or bar supplies, candles, picture frames or books), but leaving the space below free for platters during a sit-down dinner or buffet. Best of all, Legends is versatile in style, appealing to some for its casual farmhouse quality, to others for its chic urban-country quality and to others for its quiet Zen quality. By simply changing the accessories around it, you can make it your own. I love it and would to be able to come and see all you have. You are doing a wonderful job. THink of you often and miss everyone. !! !